How do we use wildcards? Let’s look at an example using the more familiar options: The question mark (?) and asterisk (*). The question mark matches any single character; the asterisk matches any group of characters (commonly called a text string). 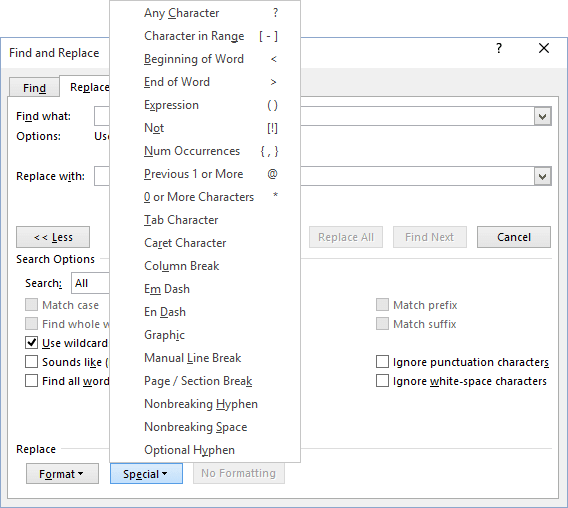 Word looks past the asterisk to see whether the search is limited by any other characters. These wildcards are handy for finding words that you don’t know how to spell. For example, if you are not sure how to spell receive, you can type rec??ve. Word then locates any word that begins with rec followed by any two characters followed by ve. What Wildcards can be used? This entry was written by colinfoster, posted on September 14, 2018 at 9:13 pm, filed under Microsoft Word, Tips and Tricks and tagged Find and Replace, Wildcards, Word. Bookmark the permalink. Follow any comments here with the RSS feed for this post. Comments are closed, but you can leave a trackback: Trackback URL.